Endow Women 2017 "Propelled to Destiny" is a conference experience for women of purpose to be inspired, empowered and equipped to fulfill their God-given purpose. Endow Women encourages women to be confident in their calling, to stand up and stand out in their industry and the world, empowering them with the tools and connections to do amazing things for God's glory in one fun-filled, faith-filled, 3-day long conference experience. At the end of the 3-days, hundreds of women of purpose who answered the call will leave EWC 2017 full of power, purpose and potential and head back to their sphere of influence and corner of the world empowered from the inside-out to transform those they come in contact with and the world with their purpose. Should You Attend Endow Women 2017? Are you a woman of purpose? Do you believe God has called you and prepared you with passion, purpose, and power for such a time as this? Then Endow Women 2017 "Propelled to Destiny" is the conference for you and other women of purpose to be inspired, empowered and equipped to fulfill their God-given purpose. 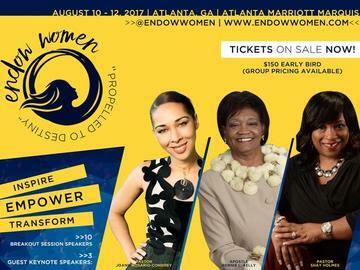 Endow Women 2017 will take place at the beautiful Atlanta Marriott Marquis in Atlanta, Ga August 10 - 12, 2017. Come expecting to connect with other women of purpose, to be encouraged and inspired by speakers, equipped by sessions on ministry, leadership, business and life, and to experience God like never before. In purchasing a ticket for Endow Women 2016 "Equipped with Purpose" you consent to video and/or photography at the conference.